Bariah whelped 4 puppies sired by Am. Can. BIS Ch. Berlane's High Voltage (Dakota), October 2002. Bariah is the repeat breeding to Kelly Jr. For a look at Bariah's pedigree, press the button. 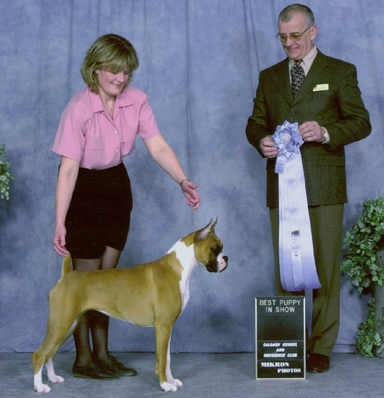 Bariah completed her Canadian championship at 9 months of age, in just two weekends of shows. She earned 2 Best of Breeds, 1 Group 4th, 3 Best of Winners, 2 Best Puppy in Groups and 1 Best Puppy in Show. She was handled to all of these wins by Karen Oxtoby.